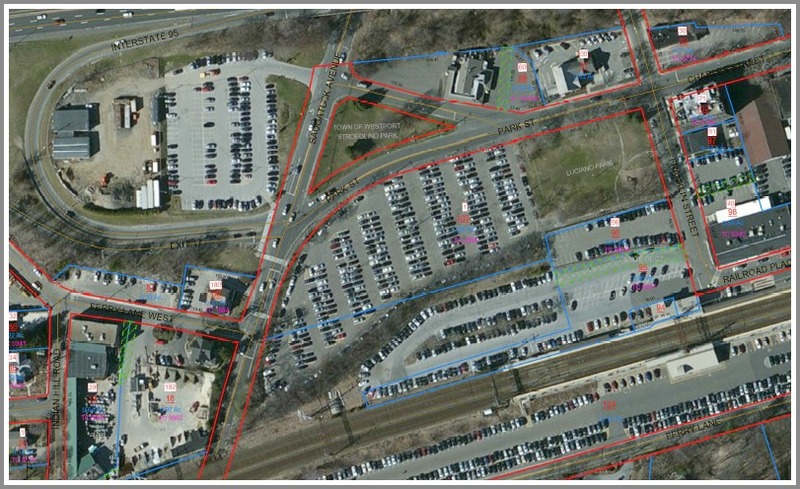 Construction begins next month on the renovation of Saugatuck train station parking lot #1. The RTM voted last night 24-2 — with 3 abstentions — to approve the controversial $1.5 million plan. There will be 2 exits, not 1 as in the original design. The one next to Luciano Park is larger too, with 1 entrance and 2 exit lanes. Also included: new LED lights; another stairway; repaving; raising the lot out of the flood zone; trees; a sidewalk, and an improved streetscape. Work is projected to be finished before Labor Day. An aerial view of train station parking lot 1 (center). This entry was posted in Local politics, Saugatuck, Transportation and tagged Saugatuck train station, Westport RTM. Bookmark the permalink. Wonder if the crew that works on this project is managed by the same group that’s working on the North Ave bridge. Did you mean Labor Day 2017 or 2018? We were told last night by Deputy Director Broadbin that this project is entirely the responsibility of the Town Dept of Public Works, and that they are committed to finishing the work by Labor Day – 2016! If that is not the case, we will all have a chance to “urge a rapid conclusion” of construction. I am certain that regular updates will be provided during construction. OK. But when is the project going to begin and where is everybody supposed to park in the meantime. I have seen no information communicated to permit holders posted anywhere!!! !